Pete Sampras (born August 12, 1971 as Petros Sampras) is an American former tennis player, regarded by many as one of the greatest in the history of the sport. A right-handed player with a single-handed backhand, his precise and powerful serve earned him the nickname "Pistol Pete". His professional career began in 1988 and ended at the 2002 US Open, which he won, defeating rival Andre Agassi in the final. Sampras held the all-time record of seven Wimbledon Men's Singles titles with William Renshaw until 2017 when Roger Federer won his 8th title. Sampras also won five US Open titles, a joint Open-era record shared by Roger Federer and Jimmy Connors, and two Australian Open titles. His 14 Grand Slam titles were a record, surpassed when Federer won his 15th Grand Slam title at the 2009 Wimbledon Championships and later also by Rafael Nadal at the 2017 French Open and Novak Djokovic at the 2019 Australian Open. Sampras won 64 singles titles. He first reached world No. 1 in 1993, and held that position for a total of 286 weeks, including a record six consecutive year-end No. 1 rankings from 1993 to 1998. In 2007, he was inducted into the International Tennis Hall of Fame. Sampras was born in Washington, D.C., the third child of Soterios "Sammy" and Georgia (née Vroustouris) Sampras. His mother emigrated from Sparta, Greece, and his father was born in the United States to a Greek father, Costas "Gus" Sampras and a Jewish mother, Sarah Steinberg. He attended regular services of the Greek Orthodox Church on Sundays. At the age of 3, he discovered a tennis racket in the basement of his home and spent hours hitting balls against the wall. In 1978, the Sampras family moved to Palos Verdes, California, and the warmer climate there allowed the seven-year-old Sampras to play tennis throughout more of the year. From early on, his great idol was Rod Laver, and at the age of 11, Sampras met and played tennis with the legend. The Sampras family joined the Jack Kramer Club, and it was here that Sampras's talent became apparent. As a teenager, Sampras trained with tennis coach Robert Lansdorp. The forehand he learned from Lansdorp was the same forehand he used throughout his career. The key was an emphasis on driving through the ball and not hitting extreme topspin. He was spotted by Dr.Peter Fischer, a pediatrician and tennis enthusiast, who coached Sampras until 1989. Fischer was responsible for converting Sampras's double-handed backhand to single-hand with the goal of being better prepared to win Wimbledon. Sampras turned professional in 1988, at the age of 16, and finished the year ranked world No. 97 after starting the year at No. 893. His first professional match was a loss to Sammy Giammalva, Jr. at the February Ebel U.S. Pro Indoor in Philadelphia. However, just one week later, at the Lipton International Players Championships in Miami, Sampras defeated two top-40 players, before losing to No. 18 Emilio Sánchez. Sampras did not defeat another top-40 player for almost six months, at which point he defeated No. 39 Michiel Schapers at a US Open warm-up tournament in Rye Brook, New York. In his first Grand Slam singles match, Sampras lost to No. 69 Jaime Yzaga of Peru in the first round of the US Open. Sampras did not advance past the quarterfinals in his next three tournaments, although he did record wins over No. 79 Jim Courier in their first career match-up, along with defeating No. 8 Tim Mayotte. The following year, Sampras slightly improved his ranking to a year-ending No. 81. He lost in the first round of the 1989 Australian Open to Christian Saceanu and, at that year's French Open, won a Grand Slam singles match for the first time in his career; in the second round he lost to eventual champion and fellow American teenager Michael Chang in their first career match-up. A few weeks later, Sampras lost in the first round of Wimbledon to Todd Woodbridge. At the US Open, Sampras defeated defending champion and fifth-seeded Mats Wilander in the second round before losing to No. 13 Jay Berger in the fourth round. To end the year, Sampras lost in the first round in four consecutive tournaments. He lost to Wilander in the quarterfinals of the tournament in Sydney. At the Australian Open, Sampras upset twelfth-ranked Mayotte in the first round before losing to thirteenth-ranked Yannick Noah in the fourth round in four sets. His first professional singles title came in February at the Ebel U.S. Pro Indoor in Philadelphia, where he defeated sixth-ranked Andre Agassi, eighth-ranked Mayotte, and eighteenth-ranked Andrés Gómez in the final. This title elevated his ranking into the top 20 for the first time. Sampras finished 1990 at No. 5, having started the year ranked No. 61 just prior to the start of the Australian Open. Sampras did not play in the 1990 French Open and again lost in the first round of Wimbledon, this time to Christo van Rensburg. Sampras played seven consecutive weeks during the North American summer hard-court season. He defeated John McEnroe in the quarterfinals of the Canadian Open, but then lost to Chang in the semifinals. He also reached the semifinals of the tournament in Los Angeles, where he lost to No. 2 Stefan Edberg. He did not advance past the quarterfinals in his next three tournaments, losing to Chang, Richey Reneberg, and Goran Ivanišević. In September, Sampras captured his first Grand Slam title, at the US Open. Along the way, he defeated sixth-ranked Thomas Muster in the fourth round and third-ranked Ivan Lendl in a five-set quarterfinal, breaking Lendl's streak of eight consecutive US Open finals. He then defeated 20th-ranked McEnroe in a four-set semifinal to set up a final with fourth-ranked Agassi. Sampras beat Agassi in straight sets to become the US Open's youngest-ever male singles champion at the age of 19 years and 28 days. He played five more tournaments and won the Grand Slam Cup to complete his year. In 1991, Sampras captured the first of his five career titles at the year-end Tennis Masters Cup. Upon entering the US Open as the defending champion that year, he caused controversy when, after losing in the quarterfinals to Jim Courier, Sampras said that he was not disappointed and felt relieved that the pressure to defend his title was no longer on him. This led to widespread criticism, which included disparaging remarks from Courier and Jimmy Connors. In 1992, Sampras reached the quarterfinals of the French Open for the first of three consecutive years, made it to the Wimbledon semifinals, and was the runner-up at the US Open to Stefan Edberg. Sampras later stated that his loss in the US Open final that year was a "wake-up call" and that he needed to figure out how to become the world No. 1. He also played doubles with John McEnroe on the US team that won the Davis Cup, duplicating the feat in 1995. 1992 was also the year when Sampras made his only competitive appearance at the Olympics. The event was played on clay, his worst surface. Nonetheless, Sampras advanced to the third round before giving up a two-set lead and losing to Andrei Cherkasov of Russia. Sampras reached the semifinals of the Australian Open in early 1993, losing again to Stefan Edberg and matching the previous year's quarterfinal performance at the French Open. In April 1993, Sampras attained the No. 1 ranking for the first time. His rise to the top of the rankings was controversial because he had not recently won any Grand Slam titles, but he justified his ranking three months later by claiming his first of seven Wimbledon titles, beating former world No. 1 and fellow American Jim Courier in the final. This was followed by his second US Open title. He finished the year as the clear No. 1 and set a new ATP Tour record that year by becoming the first player to serve more than 1,000 aces in a season. Sampras won the first of two Australian Open titles in 1994, defeating American Todd Martin in the final, and then defended his Wimbledon later that year. In 1995, Sampras battled with co-patriot Andre Agassi for the world No. 1 ranking. Sampras experienced one of the most emotional matches of his career, when he played Courier in the quarterfinals of the Australian Open. 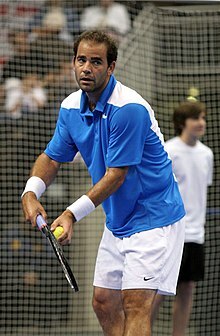 Sampras' longtime coach and close friend, Tim Gullikson, had mysteriously collapsed during the tournament and was forced to return to the United States. Gullikson was later diagnosed with brain cancer, to which he succumbed the following year. Saddened by Gullikson's illness, Sampras began visibly weeping during the match when a spectator shouted to win it for Gullikson, but managed to defeat Courier. Sampras went on to lose the final to Andre Agassi in four sets. Paul Annacone took over as Sampras' full-time coach after Gullikson's illness made it impossible for him to continue coaching. Sampras defeated Agassi in the final at Indian Wells, and then won his third straight Wimbledon title over Boris Becker. Sampras lost in the final of the Canadian Masters to Agassi, and then beat Agassi in the final of the US Open. In the year's first major, the Australian Open, the top-seeded Sampras lost to the unseeded Mark Philippoussis 6-4, 7-6(11–9), 7-6(7–3) in the tournament's third round. Sampras had what would end up being his best run ever at that year's French Open, losing in a semifinal match to the eventual winner, Yevgeny Kafelnikov, 7-6(7–4), 6-0, 6-2. In the eight Wimbledons inclusive between 1993 and 2000, 1996 was the only year that Sampras would fail to win the championship at Wimbledon. Sampras lost in the quarterfinals of Wimbledon to the eventual winner, Richard Krajicek, the tournament's 17th-seed. The match lasted three long sets, with Krajicek winning 7-5, 7-6(7–3), 6-4. 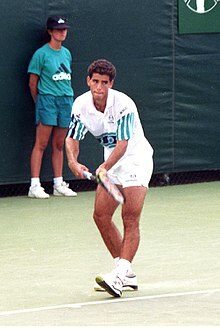 In the quarterfinals of the US Open, Sampras vomited on the court at 1–1 in the final set tiebreak (due to dehydration) while facing Àlex Corretja; nonetheless, Sampras would win that match. Sampras advanced to the finals where he defeated No. 2 Michael Chang to defend his US Open title. Sampras finished off the year by claiming the season-ending ATP Tour World Championship. 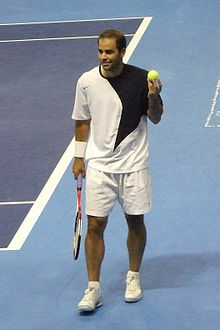 Sampras won his second Australian Open title in January, defeating Carlos Moyá in the final. In July, he won Wimbledon for the fourth time, defeating Cédric Pioline in the final. Sampras also won singles titles in San Jose, Philadelphia, Cincinnati, Munich, and Paris, and the ATP Tour World Championships in Hanover, Germany. He became the only player to win both the Grand Slam Cup and the ATP Tour World Championships in the same year. He had a 10–1 win–loss record against top-10 opponents and was undefeated in eight singles finals. He held the No. 1 ranking for the entire year and joined Jimmy Connors (1974–1978) as the only male players to hold the year-end No. 1 ranking for five consecutive years. His prize money earnings of US$6,498,211 for the year was a career high. In 1998, Sampras's No. 1 ranking was challenged by Chilean player Marcelo Ríos. Sampras failed to defend his Australian Open title, losing in the quarterfinals to Karol Kučera, and won Wimbledon only after a hard-fought five-set victory over Goran Ivanišević. Sampras lost in the final of the Cincinnati Masters to Patrick Rafter after a controversial line call. Sampras faced Rafter again in the semifinals of the US Open, losing in five sets after leading the match two sets to one, and Rafter went on to win his second consecutive US Open title. Sampras lost another semifinal at the Tennis Masters Cup to eventual champion Àlex Corretja. Nevertheless, Sampras finished the year as the top-ranked player for the sixth year in a row. The year started with a withdrawal from the Australian Open and Sampras failed to win a title during the early part of the season. However, he then went on a 24-match winning streak, including the Stella Artois Championships, Wimbledon (equaling Roy Emerson's record of 12 Grand Slam singles titles), Los Angeles, and Cincinnati (a rematch of last year's final with Patrick Rafter). Sampras' victory over Andre Agassi in the Wimbledon final is often cited as one of the greatest performances in a Wimbledon final, (despite this, he lost his no. 1 ranking to Agassi the following day, when ATP Tour rankings were updated). That run ended when he was forced to retire from the RCA Championships and the US Open because of a herniated disc in his back. Sampras' ranking was hurt through a combination of withdrawing from the Australian and US Opens, tournaments in which he had strong performances during the previous year, and the resurgence of longtime rival Agassi, putting an end to Sampras' six consecutive years of finishing as world No. 1. Agassi took over the top ranking and held it for the rest of the season, but Sampras recovered and managed to beat him in the season-ending Tennis Masters Cup for the fifth and final time, enabling Sampras to remain third in the rankings. Sampras reached the semifinals of the Australian Open in early 2000, falling to the eventual champion Agassi in a five-set match. He won the Ericsson Open for the third time in March. After getting knocked out in the first round at the French Open, he won his seventh and final title at Wimbledon, battling through tendinitis in his right shin and a painful back injury in the process equalling the then all time gentleman's singles title record of William Renshaw. This was his monumental 13th Grand Slam singles title, breaking the all-time record of Roy Emerson that had stood for over 30 years. In the 2000 US Open, Sampras overcame Richard Krajicek in four sets at the quarterfinals (including a comeback from 2-6 down in a tiebreaker) but lost the final to Marat Safin. Sampras' run to the final briefly returned him to the No. 1 ranking, but Gustavo Kuerten ended the year atop the rankings. This would be the last time Sampras was ranked No. 1, extending his ATP record career total to 286 weeks; the record was surpassed by Roger Federer in 2012. Sampras' 31-match Wimbledon win streak ended in a five set loss to Roger Federer, aged 19, in the fourth round; this was the only time the two tennis legends ever played an official professional match. At the US Open, Sampras reached the final but lost in straight sets to Lleyton Hewitt. Overall, this season was the first in 12 years that Sampras did not win a single title, and he finished the year ranked No. 10, also his lowest since 1989. In 2002, Sampras suffered an early exit from Wimbledon, losing in the second round to No. 145 fast-court specialist George Bastl of Switzerland. After that loss, Sampras asked his former coach Paul Annacone to return and coach through the US Open. Sampras had a relatively poor summer leading up to the US Open, losing at Cincinnati to No. 70-ranked Wayne Arthurs in the second round, and then being eliminated at the opening round at Long Island by No. 85. Paul-Henri Mathieu. At the US Open, Sampras was seeded 17th. Greg Rusedski, whom Sampras had defeated in a long five-set third round match at the US Open, said that Sampras was "a step and a half slower" and predicted that Sampras would lose his next match. Sampras, however, then defeated two young stars, Tommy Haas in the fourth round and Andy Roddick in the quarterfinals. He then defeated Sjeng Schalken in the semifinals to reach his third straight US Open final, and eighth US Open final overall, tying Ivan Lendl's all-time record. This time, he faced Agassi, whom he had met in his very first Grand Slam final 12 years earlier. After a four-set battle between the two veterans, Sampras claimed a then-record 14th Grand Slam singles title and matched Jimmy Connors' record of five US Open singles championships. Sampras did not compete in any tour events in the following 12 months, but he did not officially announce his retirement until August 2003, just prior to the US Open. He chose not to defend his title there, but his retirement announcement was timed so that he could say farewell at a special ceremony organized for him at the Open. At the time of his retirement, many regarded Sampras as the greatest player of all time. Sampras won 64 top-level singles titles (including 14 Grand Slam titles, 11 Super 9/ATP Masters Series/ATP World Tour Masters 1000 titles and five Tennis Masters Cup titles) and two doubles titles. He was ranked the world No. 1 for a total of 286 weeks (the second most of all-time after Roger Federer's 310 weeks) and was year-end No. 1 for an ATP record six consecutive years from 1993 through 1998. Sampras was known for his natural attacking serve-and-volley game, all-round game, and strong competitive instinct. Sampras's best surface was undoubtedly the fast-playing grass courts, Sampras won seven Wimbledon Gentleman's Singles titles (1993–95, 1997–2000), broken only by a loss in the 1996 quarterfinals to eventual winner Richard Krajicek. Sampras's seven Wimbledon Gentleman's Singles titles, tied with William Renshaw, has only been surpassed by Roger Federer who won a record eighth Gentleman's Singles title in 2017. Sampras is lauded by many tennis analysts as one of the greatest male grass-court players of all time. Sampras also shares the record of five US Open titles in the Open Era with Jimmy Connors and Federer. He won back-to-back US Open titles in 1995 and 1996, despite vomiting on the court at 1–1 in the final set tiebreak due to dehydration in the 1996 quarterfinals against Àlex Corretja. Combined with his two Australian Open titles, this gave Sampras a total of fourteen majors won on grass and hard courts. Sampras's only real weakness was on clay courts, where the slow surface tempered his natural attacking serve-and-volley game. His best performance at the French Open came in 1996, when he lost a semifinal match to the eventual winner, Yevgeny Kafelnikov. Despite his limited success at Roland Garros, Sampras did win some significant matches on clay. He won a 1992 clay court tournament in Kitzbühel, defeating Alberto Mancini in the final. He won the prestigious Italian Open in 1994, defeating Boris Becker in the final, and two singles matches in the 1995 Davis Cup final against Russians Andrei Chesnokov and Yevgeny Kafelnikov in Moscow. Sampras also won a 1998 clay court tournament in Atlanta, defeating Jason Stoltenberg in the final. On April 6, 2006, three and a half years after his retirement, Sampras resurfaced and played his first exhibition match in River Oaks, Houston, Texas, against 23-year-old Robby Ginepri. Ginepri won the match in two sets. Sampras later announced that he would be playing in World Team Tennis events. 2007 saw Sampras announcing that he would play in a few events on the Outback Champions Series, a group of tournaments for former ATP players who have met certain criteria during their careers. Sampras won his first two events on tour, defeating Todd Martin in both finals (one of which included Sampras's first trip to his ancestral homeland, Greece). Many observers noted that despite his lengthy layoff from competitive tournaments, Sampras still possessed many of the previous skills he had displayed while on the ATP tour, with commentator John McEnroe going as far as to say that Sampras would be worthy of a top five seeding at Wimbledon were he to enter the tournament. On November 20, 2007, Sampras lost the first of three exhibition matches in Asia against Roger Federer in Seoul, Korea. Two days later in Kuala Lumpur, Sampras again lost to Federer in two tiebreaks. However, Sampras was able to win the last match of the series, winning in two sets on fast carpet. On February 18, 2008, in an exhibition match during the SAP Open, Sampras defeated another active player, former No. 2 Tommy Haas. Sampras dispatched the German in 43 minutes. On March 10, 2008, Sampras played another exhibition match against No. 1 Roger Federer at Madison Square Garden in New York City. Sampras once again lost the match in three tight sets. In 2009 Sampras won two Outback Champions Series titles. He defeated McEnroe in the final of the Champions Cup Boston in February and Patrick Rafter in the final of The Del Mar Development Champions Cup in March. Sampras was present at the 2009 Wimbledon final between Andy Roddick and Roger Federer to witness Federer eclipse his mark of 14 major titles and become the most successful man in Grand Slam history. Sampras's record of 14 majors had lasted for seven years. The following year along with Federer, Andre Agassi and Rafael Nadal, he played an exhibition doubles match at Indian Wells to raise money for the people of Haiti who had been affected by the earthquake. In November 2010 Sampras reported that many of his trophies and memorabilia had been stolen from a West Los Angeles public storage facility. The loss included the trophy from his first Australian Open victory, two Davis Cups, an Olympic ring and six trophies for finishing top in the year-end rankings. Most of the stolen items have since been recovered and returned. On November 17, 2011, Sampras played and lost an exhibition match against Milos Raonic. Sampras’ serve approached 200 km/h throughout the night. The rivalry has been called the greatest of the generation of players competing in the 90's, as they were the most successful players of that decade, and had a contrasting playing style, with both Sampras and Agassi being respectively considered the greatest server and the greatest serve returner of their eras. Sampras won 20 of the 34 matches he played against Agassi. The 1990 US Open was their first meeting in a Grand Slam tournament final. Agassi was favored because he was ranked No. 4, compared to the No. 12 ranking of Sampras and because Agassi had defeated Sampras in their only previously completed match. However, Agassi lost the final to Sampras in straight sets. Their next meeting in a Grand Slam was at the 1992 French Open, where they met in the quarterfinals. Although Sampras was higher ranked, Agassi prevailed in straight sets. Their next Grand Slam meeting was at the quarterfinals of Wimbledon in 1993, where Agassi was the defending champion and Sampras was the newly minted No. 1. Sampras prevailed in five sets, and went on to win his first Wimbledon championship. With both Sampras and Agassi participating, the U.S. won the Davis Cup in 1995. Notable Sampras-Agassi matches of 1995 included the finals of the Australian Open, the Newsweek Champions Cup, the Lipton International Players Championships, the Canadian Open, and the US Open, with Sampras winning the Newsweek Champions Cup and the US Open. The next time Sampras and Agassi met in a Grand Slam final was at Wimbledon in 1999, where Sampras won in straight sets. For both, it was considered a career rejuvenation, as Sampras had suffered a string of disappointments in the last year while Agassi was regaining his status as a top-ranked player after winning the French Open. Sampras forfeited the No. 1 ranking to Agassi when injury forced Sampras to withdraw from that year's US Open, which Agassi went on to win. They faced each other twice in the season-ending ATP Tour World Championships, with Sampras losing the round-robin match, but winning the final. They played each other only once in 2000. The top-ranked Agassi defeated No. 3 Sampras in the semifinals of the Australian Open in five sets. In arguably their most memorable match, Sampras defeated Agassi in the 2001 US Open quarterfinals 6–7, 7–6, 7–6, 7–6. There were no breaks of serve during the entire match. Reruns of the match are frequently featured on television, especially during US Open rain delays. The final of the 2002 US Open was their first meeting in a US Open final since 1995. The match was also notable because they had defeated several up-and-coming players en route to the final. Sampras had defeated No. 3 Tommy Haas in the fourth round and future No. 1 Andy Roddick in the quarterfinals, while Agassi had defeated No. 1 and defending champion Lleyton Hewitt in the semifinals. Sampras defeated Agassi in four sets. This was the final ATP tour singles match of Sampras's career. In August 2010, Sampras played an exhibition game with Andre Agassi at the indoor arena Coliseo Cubierto El Campin in Bogotá, Colombia. Sampras won 12 of the 16 matches he played against Patrick Rafter, including eight of their first nine, and their final four meetings. In 1997, Rafter won the US Open, a tournament that many expected Sampras to win, having won in 1995 and 1996. The win catapulted Rafter to the year-end no. 2 rankings behind Sampras. Seven-time Grand Slam champion John McEnroe believed Rafter to be a "one-slam wonder", since it was only his second career ATP title. Up to that point, Sampras was 5-1 against Rafter, and defeated Rafter three times in fall 1997 to solidify his No. 1 ATP ranking. "We're not the best of mates," Rafter said of Sampras after 1997 Davis Cup semifinals, "I wouldn't go out for a beer with him, put it that way. I don't know what the story is. There's a bit of feeling." In 1998, Rafter came back from a set down to defeat Sampras in the Cincinnati Masters final, a title that Sampras needed to win in order get the maximum ranking points to stay No. 1 ahead of Marcelo Ríos. During that match, Rafter's serve was called out, but the umpire overruled the call to give Rafter the ace and the Cincinnati title. Sampras was displeased, and stood at the baseline for several seconds, making the victorious Rafter wait at the net, and then refused to shake the umpire's hand. Sampras, at the time winner of 11 Grand Slams, when asked about the difference between himself and Rafter, said "Ten grand slams", that a controversial line-call cost him the match, and that a player had to come back and win another Grand Slam title in order to be considered great. Rafter went on to win the Canadian Masters as well, earning the third seed at the 1998 US Open. The two met in the semifinals of the 1998 US Open, where Sampras was slowed in the third set by a leg injury and called for a trainer, and Rafter broke Sampras twice in the deciding fifth set. Sampras's loss denied him the chance to match two records—Jimmy Connors' mark of five U.S. Open titles and Roy Emerson's record of 12 Grand Slam singles titles. Sampras cited a leg injury as the reason Rafter won, an attitude that upset the Australian: "He really does say some funny things at the wrong time", said Rafter, "We are out there busting our guts and he doesn't show a lot of respect at the end of the day. He tries to play down the reason why he lost, giving no respect to the other player, and that is what really upsets me about him and the reason I try to piss him off as much as I can." Following Rafter's successful defense of his 1997 U.S. Open title by defeating Mark Philippoussis in the 1998 final, when asked about Sampras' earlier comments about having to win another Grand Slam in order to be considered great, Rafter replied: "Maybe you can ask him that question, if he thinks that now. For me, I won another Slam, and it hasn't sunk in yet. It's very, very exciting for me, especially to repeat it". For his part, Sampras said about Rafter, "When I see him holding the US Open trophy, it pisses me off." Rafter responded by calling Sampras a “cry baby” and saying that it would be better for tennis if someone besides the American were No. 1. Some had suggested at the time that the Sampras-Rafter feud was inflamed by the media since Sampras' traditional rival Andre Agassi was still in the midst of a comeback from injury. Sampras, whose struggles from 1998 continued over to early 1999, lost a third consecutive time against Rafter at the World Team Cup, in straight sets, just before the French Open. By the summer of 1999 having rebuilt his confidence, en route to compiling a 24-match winning streak of four titles including Wimbledon, Sampras prevailed against Rafter in the Cincinnati Masters final, a rematch of the previous year's final, and the two were friendly in the trophy ceremony. Later that summer, Sampras withdrew from the U.S. Open due to an injured back, while Rafter retired in the first round as a result of a torn rotor cuff. The next Sampras-Rafter match was the 2000 Wimbledon final, after Rafter overcame Agassi in the semifinals, a four-set final which included a 26-minute rain delay. Both players had flown in their parents for the Wimbledon final, the first time in years they would see their sons play. Sampras lost the first-set tiebreaker, and trailed in the second-set tiebreaker 1-4 before taking 5 consecutive points to win that set, then won the third and fourth sets for the Championship, with just 10 minutes of daylight left. That victory gave Sampras his 13th Grand Slam title, breaking the record of 12 by Roy Emerson for the most Grand Slam titles. After the match ended, Sampras called Rafter “all class, on and off the court”, while Rafter said he was lucky to overcome early season injuries to make the final. Sampras and Rafter met in the fourth round of the 2001 US Open, with Sampras winning. Sampras was an all-court player who would often serve and volley. Possessing an all-around skill, in the early years of his career, when not serving, his strategy was to be offensive from the baseline, put opponents in a defensive position, and finish points at the net. In his later years, he became even more offensive and would either employ a chip-and-charge strategy or try to hit an offensive shot on the return and follow his return to the net. He had an accurate and powerful first serve, one of the best of all time. He had great disguise on both his first and second serves, and his second serve was nearly as powerful as his first. He was known for producing aces on critical points, even with his second serves. Sampras was able to hit winners from both his forehand and backhand from all over the court. He was able to catch attacks wide to his forehand using his speed and hitting a forehand shot on the run. When successfully executed, he won many points outright or put opponents immediately on the defensive, due to the considerable pace and flat nature of the shot. This style did not help him on clay courts, according to some critics. Sampras used one racket type, the Wilson Pro Staff Original, for his entire professional career—a racket first introduced in 1983. He played with Babolat natural gut, with all his rackets re-strung before each match (used or not) at 75 lbs tension (more or less, depending on conditions). His rackets had weight added to bring them close to 400 g, but the frame proper was a production model manufactured at a Wilson factory on the Caribbean island of St. Vincent. The handles were custom-built. Post-retirement, Sampras has used a slightly modified Pro Staff Tour 90 and, from 2008, a new version of the original Pro Staff, produced with in-between head size of 88 square inches and heavier weight at 349 grams unstrung. Since mid-2010, Sampras has been spotted at multiple exhibitions playing with a Babolat Pure Storm Tour, along with Babolat's popular RPM Blast strings. "I need a little more pop...I need it if I'm going to play some tennis," he said after playing Gael Monfils in an exhibition at the SAP Open. During a good part of 2011, Sampras used a racquet that was painted all black, with Tourna Grip and Tourna Damper. In the late 1980s, Sampras signed a three-year endorsement contract with Sergio Tacchini. It was extended to five years before Sampras signed with Nike in 1994. He wore Nike apparel and Nike Air Oscillate footwear on court. Pete's father and mother are from Greece and his paternal grandmother is Jewish. Sampras's older sister, Stella Sampras Webster, is the women's tennis head coach at UCLA, and his younger sister, Marion, is a teacher in Los Angeles. His older brother, Gus, has been tournament director at the Scottsdale ATP event. In 2007 he became president of the firm managing Pete's business activities. On September 30, 2000, Sampras married American actress and former Miss Teen USA Bridgette Wilson. On November 21, 2002, their son, Christian Charles Sampras, was born. On July 29, 2005, the couple had their second son, Ryan Nikolaos Sampras. They reside in Lake Sherwood, California. Sampras has β-thalassemia minor, a genetic trait that sometimes causes mild anemia. A book titled Facing Sampras: Symposium of a Champion was published in December 2017. Politically, Sampras is a Republican. He supported John McCain in 2008. Sampras (1997–2000) won four consecutive Wimbledon singles titles, second only to Borg and Federer (who have five consecutive titles each). During the Open Era, only Borg (1978–81 French Open and 1976–80 Wimbledon), Sampras (1997–2000 Wimbledon), Federer (2003–07 Wimbledon and 2004–08 US Open), and Rafael Nadal (2005–08 French Open and 2010–2014 French Open) have won at least one Grand Slam tournament four consecutive times. Ken Rosewall, Sampras and Rafael Nadal are the only men to have won Grand Slam singles titles as a teenager, in their 20s, and in their 30s. Sampras won 40 of the 42 singles matches he played on Wimbledon's Centre Court and 63 of the 70 singles matches he played at the All England Club. Sampras is the only player to win all seven Wimbledon finals he played. In terms of most finals won at a single Grand Slam tournament without losing any, he is second to Nadal in the Open Era (who won all eleven of his French Open finals), and tied with Novak Djokovic (who won all seven of his Australian Open finals). U.S. Olympic Committee "Sportsman of the Year" in 1997. He was the first tennis player to receive this award. GQ Magazine's Individual Athlete Award for Man of the Year in 2000. Selected the No. 1 player (of 25 players) in the past 25 years by a panel of 100 current and past players, journalists, and tournament directors to commemorate the 25th anniversary of the ATP in 1997. Voted 48th athlete of Top 50 Greatest North American Athletes of ESPN's SportsCentury (also youngest on list). In 2005, TENNIS Magazine named Sampras the greatest tennis player for the period 1965 through 2005, from its list, "The 40 Greatest Players of the TENNIS Era". ^ This record was achieved in non-consecutive Majors. The record for most consecutive Grand Slam finals won is 4, achieved by Rod Laver in 1969 (the same year he achieved the Grand Slam) and Novak Djokovic in 2015—16. ^ Dillman, Lisa (July 16, 2002). "Sampras Lets Higueras Go". Los Angeles Times. ^ Tennis magazine ranked Sampras the best player of the period 1965–2005. ^ "Pete Sampras - Top 10 Men's Tennis Players of All Time". Sports Illustrated. Archived from the original on September 18, 2010. Retrieved June 10, 2017. ^ "Sampras visits ancestral home for first time". MSNBC. Associated Press. May 15, 2008. Retrieved February 20, 2008. ^ Higdon, David (October 2, 1996). "Questions from the Net: Your Top Ten Questions to Pete Sampras". Tennisserver.com. Retrieved February 20, 2008. ^ Srinivasan, Archana (2007). Biographies of Bio-Sporting Legends. Sura Books. p. 80. ISBN 81-7478-644-9. ^ a b "The King of Swing. Pete Sampras". Petesampras.com. Archived from the original on May 9, 2008. Retrieved February 22, 2008. ^ Spadea, Vince; Dan Markowitz (2006). Break Point: The Secret Diary of a Pro Tennis Player. ECW Press. pp. 36, 125. ISBN 1-55022-729-7. ^ Shifrin, Joshua (2005). 101 Incredible Moments in Tennis: The Good, the Bad and the Infamous. Virtualbookworm.com Publishers. p. 229. ISBN 1-58939-820-3. ^ Robson, Douglas (June 24, 2008). "One-handed backhand now a rarity in post-Henin era". USA Today. Retrieved June 5, 2010. ^ "Pete Sampras' Rankings History for 1988". Official ATP World Tour website. Retrieved February 7, 2017. ^ "1988 Player Activity for Pete Sampras". ATP World Tour. Retrieved January 18, 2018. ^ "Pete Sampras' Rankings History for 1989". Official ATP World Tour website. Retrieved February 7, 2017. ^ "1989 Player Activity for Pete Sampras". ATP World Tour. Retrieved January 18, 2018. ^ "Pete Sampras' Rankings History for 1990". Official ATP World Tour website. Retrieved February 7, 2017. ^ Srinivasan, 2007, Bio-Sporting Legends, p. 83. ^ "1990 Player Activity for Pete Sampras". ATP World Tour. Retrieved January 18, 2018. ^ Schwartz, Larry. "Sampras competes against best – ever". ESPN. Retrieved February 20, 2008. ^ "Upon Hall of Fame Induction, Sampras Says a Loss Spurred Wins". The New York Times. Associated Press. July 15, 2007. Retrieved February 20, 2008. ^ Sampras, Pete; Peter Bodo (2008). A Champion's Mind: Lessons from a Life in Tennis. Crown Publishing Group. p. 92. ISBN 0-307-38329-6. ^ Bud Collins (January 26, 1995). "Old friends battle it out to the death". Archived from the original on August 8, 2009. Retrieved June 27, 2009. ^ a b Jennifer Frey (September 11, 1995). "With Dedication, Sampras Aces Third U.S. Open". Washington Post. ^ White, Derrick (January 27, 1997). "Tennis: Sampras barely breaks sweat". The Independent. London: Independent Print Limited. Retrieved May 9, 2012. ^ Roberts, John (July 7, 1997). "Tennis: Wimbledon '97 – Sparkling Sampras reigns supreme". The Independent. London: Independent Print Limited. Retrieved May 9, 2012. ^ "Sport: Tennis – Pistol Pete fired from Open". BBC Sport. British Broadcasting Corporation. January 27, 1998. Retrieved May 8, 2012. ^ Selena Roberts (September 7, 2000). "U.S. Open; Sampras Awakes To Stop Krajicek". The New York Times. ^ "Aussie disarms Sampras serve, rolls to U.S. Open". Sports Illustrated. Retrieved September 9, 2013. ^ "U.S. Open – The day Pete Sampras' fire returned – ESPN". Espn.go.com. September 6, 2012. Retrieved August 3, 2014. ^ "Sampras wins first title in more than two years". Sports Illustrated. Retrieved September 9, 2013. ^ a b Jim Litke (2003). "Sampras: '100 Percent Retired'". CBS News. Retrieved April 25, 2012. ^ Raymond Lee (September 14, 2007). "Greatest Player Of All Time: A Statistical Analysis". Tennis Week. Archived from the original on June 28, 2009. Retrieved June 27, 2009. ^ "40 Greatest Players of the Tennis Era". Tennis magazine. Archived from the original on August 14, 2009. Retrieved February 14, 2007. ^ based on total wins per surface. ^ Ulmann, Howard (February 7, 2007). "Sampras 'to see how it goes' in Champions Series return". USA Today. Retrieved February 20, 2008. ^ "Pete Sampras beats Todd Martin to win Athens seniors event". Associated Press. May 20, 2007. Archived from the original on December 10, 2008. Retrieved February 20, 2008. ^ "Senior tour a crowd-pleasing idea". The Gazette. May 15, 2007. Archived from the original on February 14, 2008. Retrieved February 20, 2008. ^ "Federer beats Sampras in first of three exhibitions". Associated Press. November 20, 2007. Retrieved February 20, 2008. ^ "Third time the charm as Sampras wins in straight sets". ESPN. November 24, 2007. Retrieved December 5, 2010. ^ "Sampras shows no mercy in beating Haas in exhibition". Associated Press. February 19, 2008. Archived from the original on December 8, 2008. Retrieved February 20, 2008. ^ "Clash of the Tennis Titans". The Tennis Channel. 2008. Archived from the original on February 18, 2008. Retrieved February 22, 2008. ^ "2009 EVENTS". Archived from the original on February 17, 2009. ^ "Pete Sampras' tennis trophies stolen". ESPN. December 8, 2010. Retrieved December 9, 2010. ^ "Pete Sampras tennis trophies stolen from storage depot". BBC News. December 8, 2010. Retrieved December 9, 2010. ^ Dwyre, Bill (December 7, 2010). "One of tennis' ultimate winners, Pete Sampras, suffers a major loss". Los Angeles Times. Retrieved December 9, 2010. ^ "Sampras' stolen trophies turn up at hospital – News | FOX Sports on MSN". Msn.foxsports.com. March 22, 2011. Retrieved July 9, 2012. ^ faceofftennis (November 22, 2011). "Big-serving Canuck Raonic downs the great Sampras « The Face-Off presented by SAP". Samprasvsraonic.com. Archived from the original on April 26, 2012. Retrieved July 9, 2012. ^ Muir, Allan. "Breaking news, real-time scores and daily analysis from Sports Illustrated – SI.com". Sportsillustrated.cnn.com. Retrieved August 3, 2014. ^ "Sampras-Rafter Career Head-To-Head". Atpworldtour.com. Archived from the original on July 7, 2012. Retrieved July 9, 2012. ^ Holden, Kit (August 28, 1998). "Tennis: Rafter learns the mind game". The Independent. London. Retrieved July 9, 2012. ^ a b Lisa Dillman (July 9, 2000). "There's a Little Tension in Sampras, Rafter Rackets". Los Angeles Times. ^ a b Dillman, Lisa (September 14, 1998). "Rafter Grandly Slams U.S. Open Criticism". Articles.latimes.com. Retrieved July 9, 2012. ^ Dillman, Lisa (July 9, 2000). "There's a Little Tension in Sampras, Rafter Rackets". Articles.latimes.com. Retrieved July 9, 2012. ^ Holden, Kit (August 28, 1999). "Sampras slight raises stakes for 'Pat-trick'". The Independent. London. Retrieved July 9, 2012. ^ "Sampras sets record with win against Rafter". CNN. ^ "2000 Wimbledon final: Pete Sampras defeats Pat Rafter". Tennis Buzz. July 4, 2010. ^ "Fired-up Sampras takes it to Rafter, faces Agassi next". CNN. ^ "Had you written off Pistol Pete?". BBC Sport. August 19, 2002. Retrieved June 5, 2010. ^ "Pete Sampras's serving style". Retrieved July 7, 2008. ^ "Second Serve Style and Speed". Retrieved July 7, 2008. ^ "Pete Sampras and the French Open". Top Spin. Retrieved February 5, 2016. ^ "Q & A with Nate Ferguson, Sampras' personal stringer". Tennis Warehouse. August 1999. Archived from the original on March 29, 2008. Retrieved June 27, 2009. ^ "Wilson K Factor KPro Staff 88 Racquet Review". Tennis Warehouse. Retrieved June 26, 2009. ^ "Eyewitness report". Tennis Warehouse. May 2010. Retrieved February 8, 2011. ^ "Pro Shop Q&A Tennis Magazine". Tennis.com. September 3, 2010. Retrieved February 8, 2011. ^ "Associated Press article". CBS 5 San Francisco. February 7, 2011. Retrieved February 8, 2011. ^ Thomas, Louisa (October 20, 2011). "The Strange Career of Sergio Tacchini". Bloomberg Businessweek. Retrieved September 10, 2014. ^ Schonberger, Nick (August 12, 2011). "How Tinker Hatfield Got Pete Sampras In The Nike Air Oscillate". Complex. Retrieved September 9, 2014. ^ Behniwal, Ajaybir (May 2, 2007). "Women's tennis nets good draw through recent wins". The Daily Bruin. ASUCLA Student Media. Archived from the original on September 29, 2007. Retrieved May 20, 2007. ^ "Tennis Legend Pete Sampras Forms New Company – Pure Sports Management" (PDF). Press Release. March 29, 2007. Retrieved August 24, 2007. ^ "Actress Brigette is Sampras love match". CNN. Associated Press. October 2, 2000. Archived from the original on May 26, 2006. Retrieved May 20, 2007. ^ "Sampras Adds New Title: Father". The New York Times. November 26, 2002. Retrieved May 20, 2007. ^ "Review 2005: Celebrity births, marriages and deaths". Manchester Evening News. December 12, 2005. Retrieved May 20, 2007. ^ "Pete Sampras' House in Lake Sherwood". Home-designing.com. March 21, 2010. Retrieved August 3, 2014. ^ "Clay soils Pete's record". BBC Sport. May 23, 2002. Retrieved February 22, 2008. ^ a b Buddell, James (August 26, 2011). "DEUCE – Pete Sampras – The Making Of A Champion". ATP World Tour. Retrieved February 4, 2012. ^ Macpherson, Paul (January 12, 2010). "Roger's Records To Stand Test Of Time". ATP World Tour. Retrieved June 20, 2012. ^ "Pete Sampras touts Roger Federer". ESPN.com. ESPN Internet Ventures. Associated Press. February 5, 2008. Retrieved February 5, 2008. ^ "ATP Bio:Pete Sampras". Retrieved June 26, 2009. ^ "Bio:Pete Sampras". Gabby Awards. Archived from the original on April 12, 2009. Retrieved June 26, 2009. ^ "Pete Sampras Left Behind A Legacy Few Players Can Ever Match". Archived from the original on May 3, 2009. Retrieved June 27, 2009. Collins, Bud; H. A. Branham (1996). Sampras: A Legend in the Works. Chicago: Bonus Books. ISBN 1-56625-062-5. Pete Sampras and Peter Bodo (2009). Pete Sampras: The Autobiography – A Champion's Mind. London: Aurum Press. ISBN 978-1-84513-469-3. Wimbledon Classic Match: Federer vs Sampras (2001) Standing Room Only, DVD Release Date: October 31, 2006, Run Time: 233 minutes, ASIN: B000ICLR98. Legends of Wimbledon – Pete Sampras (2006) Standing Room Only, DVD Release Date: October 31, 2006, Run Time: 60 minutes, ASIN: B000ICLR84. The Netjets Showdown: Pete Sampras vs. Roger Federer (2008) Arts Alliance Amer, DVD Release Date: April 22, 2008, Run Time: 180 minutes, ASIN: B0013PVGN6.